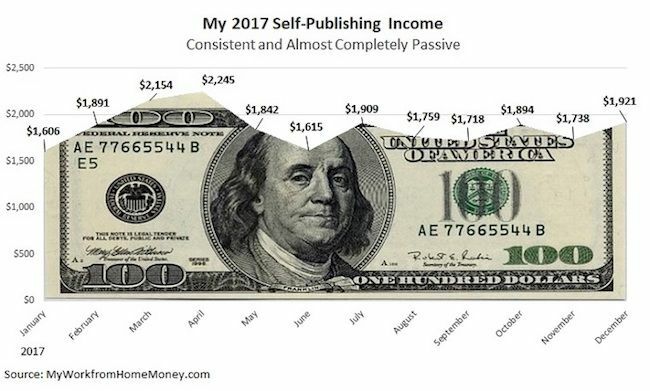 Self-Publishing Passive Income - How this blogger makes $1,900/month. Self-Publishing: How one blogger makes $1,900/month in passive income. Hola Tribe! I’m stoked to bring you a guest post today from the legendary Joseph Hogue. 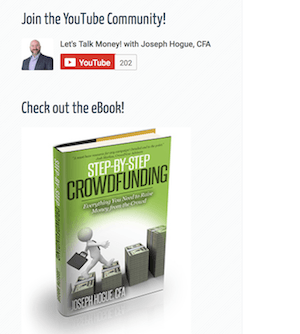 Joseph runs at LEAST 5 blogs in the “make money online” and crowdfunding niches, and brings in sweet revenues from his self-publishing ebooks. I find this stuff SUPER intriguing, and I’ve sprinkled in my own notes below. Enjoy, and show him love on his new YouTube channel as well! Most bloggers make the majority of their money from advertising and affiliates. That’s ok, I make almost half my income from affiliates, but they both take so much time. Not only do you need to craft persuasive reviews and call-to-action snippets for your affiliates but you have to build links to your posts to rank them on Google. Even if you start making money on an affiliate, there’s always the constant threat the company will cancel its program. There’s a better form of blog monetization, a passive form. I’m going to share my favorite passive income source, how to set it up and how to make money every month well after you’ve moved on to the next product. This income source is a natural fit for bloggers and leverages the traffic of the largest e-commerce site in the world. Self-publishing is a natural fit for bloggers. You’re already creating content on a regular basis. Whether you’re able to reformat your existing content into a book or just strategically use your content calendar to plan your book, it takes less than three months to self-publish. You already know that blogging is worth it. Maybe you’ve already reached the six-month or one-year milestones. If so, congratulations because you have already made it past the hardest part of blogging, knowing if you have the motivation to blog long-term. The passion to write is already inside you, which is why self-publishing is something more freelancers should be pursuing. You don’t have to wait to make it big and be offered a book deal from a major publishing company. Without a book deal, I self-published my first book five months after I launched my first blogs and was immediately earning more from the book sales than traditional advertising and affiliate income streams. Besides the initial time investment to write, edit, and launch the book, I now make $1,500-1,900 a month with minimal effort. If you’re cash-strapped, you can publish your book entirely by yourself for less than $100 as you will only have to pay a graphic designer and (maybe) a proofreader. Since self-publishing is virtually free, there are very few barriers to entry besides the extra time commitment. Note: If you’re looking for a ton of other passive income ideas, my friend Denis has THE post to bookmark right here). Another reason why I like self-publishing is that I can make money without blog traffic. Don’t get me wrong, traffic certainly helps because you can shepherd visitors from your blog to the book listing, but it isn’t required because the product is listed on Amazon because it’s a separate platform. Whenever you invest in the stock market, any credible broker will diversify your portfolio to reduce volatility. Think of self-publishing as income diversification. Blog traffic fluctuates depending on the season and the Google algorithm updates. You might even decide to sell your blog one day and lose that passive income stream altogether. As long as your book is listed on Amazon and remains time-relevant, you can earn passive income in perpetuity. Do use your blog to promote your book in your posts and mailing list, but don’t be afraid to market it to your social media followers too. Any publicity increases the likelihood of making a sale. As with anything in life, the first time for everything is usually the most difficult. It’s no different with writing a book. Figuring out what to write about and even writing the first chapter are the two most significant hurdles. Once you start putting down your first thoughts, it gets a lot easier. Having a plan to self-publish your book will make the process easier. One thing I found that helped me stick to my timeline was writing a chapter a week that paralleled as my regular blog post, but I’d keep the juiciest details for the book. Not only would I get another book chapter completed, but I would also begin ranking in Google for my target keywords. Of course, I put links to the book listing in these posts so visitors have the option to click-through and finish reading the rest of the information. After your first book is published, start thinking about the next book you can publish. Your second book can be a follow-up to your original topic or a completely different niche; I’ve done a little of both with my successive books. The more books you publish, the more opportunities you have to earn passive income. In 2017 alone, I wrote three different books. You may only have the time to write one book a year and that’s perfectly acceptable. Make sure it’s quality work that somebody will want to read; positive reviews are essential to selling more copies. Your first couple of books should come from topics in which you have a lot of experience. That will help the writing process go more smoothly and it’s likely to be your best work versus a topic you have to research. Finding an idea is fairly easy using Amazon as a research tool. Just search for a couple of ideas related to your topic. 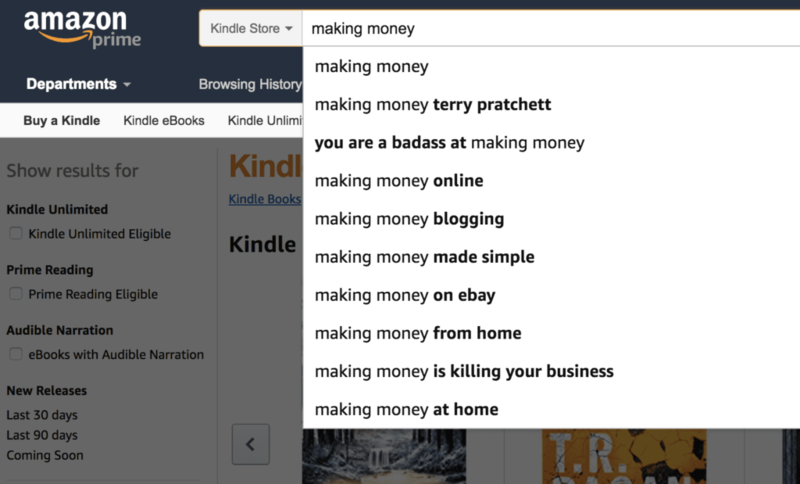 Using the search box in Amazon is also a good idea to find popular keywords people are using to search. You’ll want to use some of these keywords in your title and on your Amazon page to rank your book on Amazon. Searching for your book topic, click through some of the best-sellers and check out their book page. Click on the ‘see inside’ panel to check out the table of contents. What common ideas are all the books hitting and what are they missing? Check out the reader reviews. Are there points readers liked or disliked about the books? You’ll also want to review the ‘Amazon best-seller’ rank in the book details section of each book. This gives you an idea of how difficult it is to rank a book in that category. Most new authors can sell between one to three books a day with a little work. It will be much harder to sell more than that without major promotion so avoid categories where most books have best-seller rankings of 50,000 or less. The technical aspect of self-publishing, i.e. formatting and publishing on different sites, is actually one of the easiest steps. There is no minimum word count on most self-publishing sites though you’ll want at least 50 pages at an average of 220 words per page, so you can turn it into a print copy as well. I get almost exactly a third of my sales each month from each format; digital, print and audio so you want to take advantage of each. I’ve experimented with longer books, above 150 pages, as well as shorter series with each book around 80 pages. The series are great because they each take less time and you can cross-sell them or bundle them together. You’ll get the occasional bad review that they’re too short but write a quality book and most reviews will be overwhelmingly positive. You can charge slightly more for a longer book but writing anything more than 200 pages is just taking valuable time from writing the next book. I write everything up in a Word document and upload it directly onto Amazon Kindle. You might need to format it in pdf, mobi or epub for other publishing sites and for digital sales but most will accept a Word document. Once you’ve uploaded your book to Kindle Direct Publishing (KDP) and filled out the book page information, it usually takes less than two days for the book to be approved and published. Another reason why self-publishing is my favorite passive income source is that there are so many places to publish besides Amazon Kindle. Kindle eBooks are consistently one of the most popular media formats for my books but don’t forget about Amazon’s other publishing formats. CreateSpace lets you sell print-on-demand paperback copies and Audible is the audiobook version of your book. Both of these formats are optional, but I currently get a third of my income from each option. Converting your book file from a Kindle PDF to a CreateSpace PDF take a little more time, but is a natural step in the publishing process and well worth the extra investment. The more publishing options you pursue, the higher your passive income will likely be. You should also consider Smashwords, Apple, Kobo, and Barnes & Noble as self-publishing avenues too. When I first launch a book, I only charge $0.99 for the book and ask my friends and colleagues to leave a review. Both of these actions will increase the book ranking to populate higher in product searches. After the first week, I usually raise the price to $2.99 or higher to begin earning more royalties from the ranking boost. Never charge more the $7.99 until you are an established author, this seems to be the price point most Kindle users are willing to pay. With a little extra work, self-publishing opens another door to make money through your blog. And, it’s a perfect outlet when you can’t squeeze everything you need to say into a series of 1,000-word posts. Do you agree or disagree that self-publishing is an excellent alternative to advertising and affiliate links? Thanks Shawn. Self-publishing is such a great fit for bloggers, not only for monetization but for outreach and authority-building. The only problem with self-publishing is that most of what is written is a plagiarism of other books, intentional or not. Very few are innovative and more often from people either out of school or just newbies in a domain they think have mastered by chance. You do not have a martingale because you won a lottery once. Anyway, to generate some money (and I do not call that incomes) from ebook, you’ll need talent and a huge lot work on marketing to start the pouring, if it ever happen. And if you stop, it stops too. Far from being passive. Unless you are Elvis and outcrowd with talent, you will just be drawn by the millions of new blog posts every day and new ebook titles which will push your down to oblivion. What business structure do you recommend for a self-publisher that would like to become a publishing company before starting to self-publish? LLC treated as S-Corp or C treated as S-Corp? I’d suggest sticking with a single-member LLC or even sole proprietorship (or any pass-through entity)–up until the point where you’re either hiring employees are making significant income and need to switch things around for legal reasons.